Dr Mahathir presents the award to Agong in a ceremony at the Istana Negara. 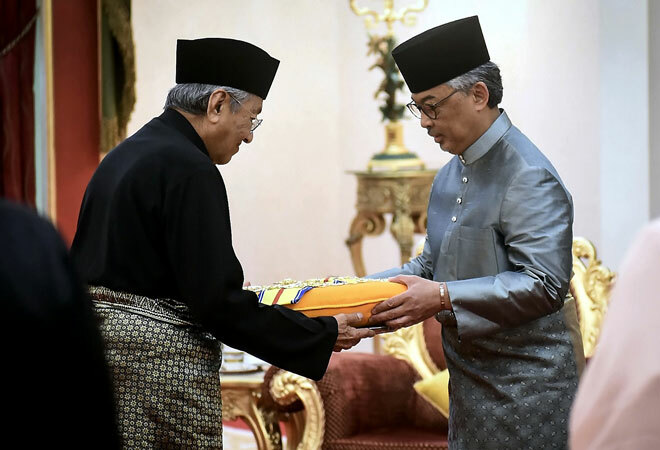 KUALA LUMPUR: Yang di-Pertuan Agong Al-Sultan Abdullah Ri’ayatuddin Al-Mustafa Billah Shah was yesterday conferred the Darjah Utama Seri Mahkota Negara (D.M.N) or the Order of the Crown of the Realm in a ceremony at the Istana Negara here. The federal award was presented to the King by Prime Minister Tun Dr Mahathir Mohamad. Raja Permaisuri Agong Tunku Azizah Aminah Maimunah Iskandariah Almarhum Sultan Iskandar was in attendance. The D.M.N consists of five components, namely a collar, a badge on the collar, a star, a sash, and a badge on the sash. It is normally conferred to the Queen of Malaysia, and newly appointed Malay rulers in his state, as well as other distinguished individuals.